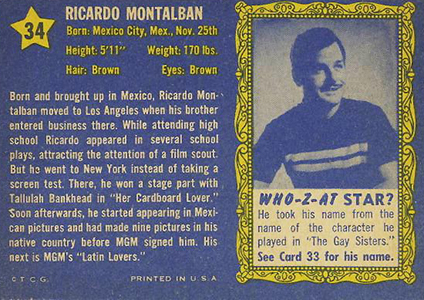 1953 Topps Who-z-at Star is a product of the Hollywood studio system where actors were treated kind of like athletes today. They would sign long-term contracts tying them to specific production studios. 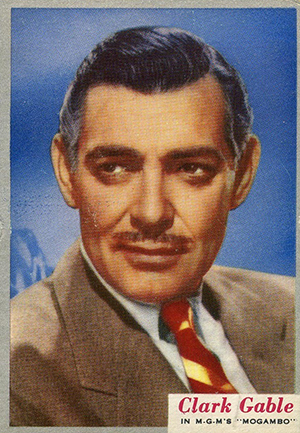 But while cross-license entertainment trading card sets are largely a thing of the past, this studio system led to many different sets through the 1950s. 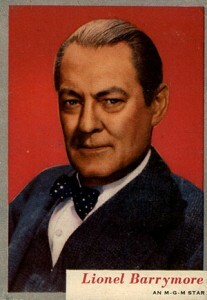 1953 Topps Who-z-at Star focuses on some of Hollywood's biggest names coming out of World War II. They're highlighted by gorgeous portraits and a very simple design, at least on the card fronts. Released long before the days of Photoshop, images are done using a process called Flexichrome, which makes colors pop in a very distinct and vibrant way. It's a complicated and time-consuming process that The Topps Archives does a good job of breaking down. It is worth noting that Flexichrome has nothing to do with chromium card stock (although the colors would lend themselves well to a Topps Chrome update). 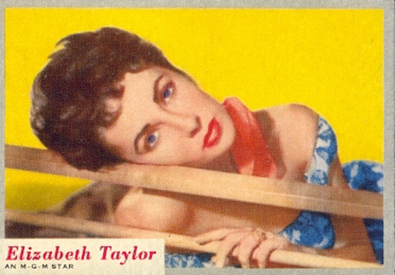 The 80-card checklist includes several all-time great actors and actresses, such as Elizabeth Taylor, Clark Gable, Errol Flynn, Janet Leigh and Gene Kelly. 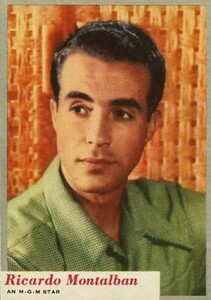 Besides the studio portraits, card fronts have a small white box with the actor's name. There's also a note of which studio, movie or show they're affiliated with. Cards have a silver border, perhaps to go with the silver screen theme. The Who-z-at name comes from a trivia component that's integrated on the card backs. As one might expect, each actor gets a bio as well as some sports card-esque vitals at the top of the card. Backs also have a second picture on the back and a clue for the previous card, challenging collectors to guess Who-z-at? Seeing as how this was before the Internet Movie Database, TMZ or Wikipedia, it was a little more challenging to keep up with celebrities. 1953 Topps Who-z-at Star? is somewhat overlooked today. Like athletes, a lot of movie stars have their fame rise and fall. Raw singles can be found for reasonable amounts. That soars for professionally graded copies that are Near Mint or higher. Cards were originally sold in both one-cent and five-sent packs. I have a complete set of 80 Who-Z-At trading cards in excellent condition. What are they worth? How do I get top dollar since they are a complete set?